Location : One of the holiest city of Hindus, and one of the oldest cities in India, Allahadbad is situated in the state of Uttar Pradesh at the confluence point of Rivers Ganga and Yamuna. It is 240 km from Lucknow, the state capital, 135 km from Varanasi, the oldest town of Uttar Pradesh, and 585 km from the national capital, Delhi. Climate : Climate in the city is extreme, with summer temperatures soaring to 45 degree Celsius max. and winter temperature decelerating to 12 degree Celsius. Known For : Maha Kumbh, Ardh Kumbh, Allahabad Fort, Sangam or confluence of the three most sacred rivers of India-Ganga, Yamuna and Saraswati. Sangam : Sangam, literally meaning 'confluence' is the meeting point of three very important rivewr of India, namely Ganga, Yamuna and Saraswati. It is the pilgrimage site of great importance for the Hindus as Kumbh Mela is held here every 12 years and the ashes of the dead are immersed, including that of Mahatma Gandhi. A bath here in the holy waters, is considered to wash all the sins away and reach heaven after their demise. Allahabad Fort : Built by Mughal Emperor Akbar in 1583 AD, this fort is situated on northern banks of River Yamuna. Allahabad Fort is situated near Sangam, on the banks of River Yamuna. The largest of all the forts built by Akbar, this one is a real masterpiece with its brilliant architecture, a synonym of Mughal craftsmanship. The fort embodies the remarkable Jodhabai Mahal, the Patalpur temple, Saraswati Kund and Akshaya Vat and is adorned by huge walls, towers and gateways. Anand Bhavan And Swaraj Bhavan : The beautiful white palace has served as an ancestral home to Jawahar Lal Nehru, who was the first Prime Minister of India and played an important role in the Independence struggle, and his family including his daughter Indira Gandhi. The palace now houses a museum and library. The museum consists of several personal items and furniture that were used by the Nehru family and Mahatma Gandhi too, when he came to meet them. In close proximity to the Anand Bhavan is the Swaraj Bhavan where Moti Lal Nehru used to stay before 1930. It has also been now converted into a museum. It is the place where Jawaharlal Nehru's daughter and first women Prime Minister of India, Indira Gandhi, was born. Bharadwaj Ashram : The importance of this Ashram can be known from the fact that its name appears in the most revered Hindu epic Ramayayana as a place where Lord Rama sought preachings of a sage during his stay in the forest. Bharadwaj Ashram is the place where renowned saint Bharadwaj used to stay. 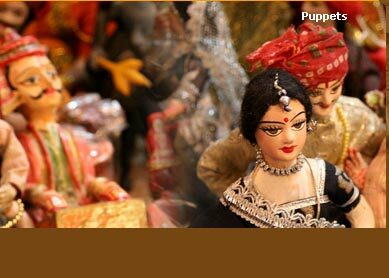 Purna Kumbh Mela :The Purna Kumbh Mela takes place after every 12 years, the next one is scheduled in February, 2013. 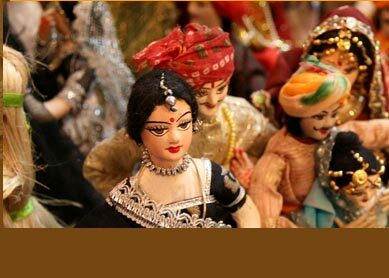 It is the most auspicious fair for the Hindus and involves the largest gathering of the World. The Kumbh Mela of 1989 saw witnessed a round fifteen million devotees who took a dip in the Sangam waters. In Hindu Mythology, it is believed that Gods churned the holy ocean, with the help of demons, to get nectar for immortality of the Gods. But the demons started fighting for the nectar port, which resulted in drops of nectar beiing fallen in four places that became pilgrimage sites. These places are Prayag, Ujjain, Nasik and Haridwar. The Maha Kumbh, that takes place after 12 Purna kumbhs, or 144 years, takes place only in Prayag, Allahabad while the Purna Prayag takes place in all the four pilgrimage sites. Ardh Kumbh : Ardh Kumbh takes place in the months of April/May after every six years. 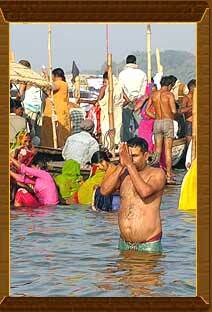 Magh Mela : The Magh Fair or Magh Mela takes place in January/ February and lasts for a month or so. Millions of people come to the banks of Sangam to take a holy dip in the sacred waters and wash away their sins during this holy fair. Various ashrams put up camps where kalpavasis stay during the period of the fair. It is also widely known as the Mini Kumbh as it is the annual version of the Kumbh. Deepavali : Grandly celebrated across the country in the month of October/November, Diwali or Deepavali is the main festival of the Hindus and is referred as the festival of lights bringing joy and happiness. In Allahabad, the festival attains special celebrations as Puja, Arti, fairs, decorations diyas light up the banks of the sacred rivers Ganga and Yamuna. Katra, Chowk, the Civil Lines, MG Marg, Vivekananda Marg, stalls near Sangam and the markets of Allahpur are the areas worth a visit to shop for nick- knacks, religious paraphernalia like incense sticks, camphor, etc., idols of Gods and goddesses in silver and bronze and philosophical books from the most renowned and best of publishers in the country. Don't forget to taste the specialty of Allahabad, seedless and sweet guavas, while you tour around the city. Air : The main airport near Allahabad is in Varanasi, connecting it to major cities of the country. Rail : The city is well connected with important cities through a network of railway routes and regular trains from Allahabad Junction, the main Railway station located in the heart of the city. Road : National Highway 2 and 27 pass through he city. Even AC Buses and Private Coaches to Delhi and Kolkatta are available from Allahabad.